Dr. Reeves and her assistant was professional and caring. Information was shared before and after any treatment was performed.Looking forward to the next visit. Dr. Reeves and her assistant was professional and caring. Information was shared before and after any treatment was performed. Looking forward to the next visit. I found Dr. Pollyanna Reeves on Zocdoc I really needed to see someone for my current issue luckily I found apodiatrist so close to home in Homestead and I was very pleased with my overall visit and their availability with appointments so easy to schedule on Zocdoc didn’t even have to call. Dr. Pollyanna Reeves made me feel so comfortable along with her nurse Tina, and she created a plan to help me get better. Bianca her receptionist got me in and out, fasted appointment I have ever been to. I would definitely recommend Dr. Reeves she is amazing. I found Dr. Pollyanna Reeves on Zocdoc I really needed to see someone for my current issue luckily I found a podiatrist so close to home in Homestead and I wasvery pleased with my overall visit and their availability with appointments so easy to schedule on Zocdoc didn’t even have to call. Dr. Pollyanna Reeves made me feel so comfortable along with her nurse Tina, and she created a plan to help me get better. Bianca her receptionist got me in and out, fasted appointment I have ever been to. I would definitely recommend Dr. Reeves she is amazing. Dr. Pollyanna Reeves is a skilled and reliable podiatrist, catering to the communities of Homestead, Miami, and South Miami in FL. She attended Barry University, Miami Shores, where she earned her doctoral degree in podiatric medicine. 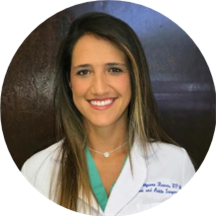 She is residency trained in podiatric medicine and surgery at Jackson South Community Hospital. Practicing at Garnet & Carbonell, D.P.M., LLC, Dr. Reeves welcomes patients for the treatment of a range of common and specialized conditions. She has a passion for practicing cost-effective, evidence-based, and compassionate medicine. Dr. Reeves realizes surgical care is often warranted but should be thoroughly discussed with the patient. She believes in fostering a healthy physician-patient relationship that facilitates assurance and respect. Dr. Reeves is an active member of the American Podiatric Medical Association, the Florida Podiatric Medical Association, and the American College of Foot and Ankle Surgeons. She is a recipient of numerous awards and honors in her field of specialization and has a keen interest in research. She was great and did all she could to make me feel comfortable during the procedure. She gave me options and discussed each one so I felt I made the right decision. She was very professional and explain everything completely and her staff was getting everything ready while the doctor was taking. I fell in love with Dr. Reeves the moment I met her. Not only does she have phenomenal bedside manners, but she speaks to you in layman terms. I wish all physicians were like Dr. Reeves. Thank you!